Don passed away peacefully on April 18, 2018 after a lengthy illness. He is survived by his loving wife of 61 years, Doreen; sons Dan (Erin) and Bruce; daughter Diana (Ross “Doogie”); grandchildren Rogan (Keri), Krystal (Mike), Chris (Joey), Brittnie (Drew), Kylie (Oliver), Brodie and Nathan; brother Arvey (Eileen); sisters Judy (Dave) and Brenda (Terry). Don was predeceased by sisters Margaret and Shirley and by brother Russell. Don was born in Elk Point AB on October 17, 1933. He worked as a CN Locomotive Engineer for 40 years, in Prince George, Jasper, and Kamloops where he retired in 1990. After he retired he loved to Snow Bird in whatever RV they had at the time. 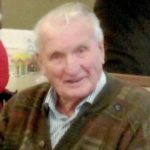 Don had a great love for music, dancing and playing his harmonica, enjoyed riding his bike, fishing and spending time with his grandchildren and great grandchildren. He coached minor hockey and loved to curl. Later in life he was a member of Good Sam’s Club and enjoyed camping with them. We are so sorry to hear of the loss of your dad. Hold your memories close to your sad heart, it will help you get through. Sending love and condolences to the family. Michele, Virgil, Chelsea, Shannon, Brodie & Emma. Don will be missed for his love of music and story telling. Don was a great family man. Our condolences to the family of Don. I worked with Don at CN for many years & he was a great guy & always a pleasure to be around. Our deepest condolences to the entire family. Don will be missed greatly by all that knew him. Love Kevin, Debbie and the Millar Clan. Sad to hear of Dons passing, he was a good friend and a person I always enjoyed working with on the railway. Will miss the coffee stops at the mall when Don was out and about, he always had a good line of BS. Please know that you are in our thoughts at this difficult time. Our deepest sympathy to Aunt Doreen and family, We will sincerely miss Uncle Donald’s smile, sense of humor and love for family. Know, you are all in our thoughts and prayers during this very sad time. God Bless and take care of you all. Don worked with my husband Vernon in Jasper and what a surprise when he and Doreen became our neighbors in Kamloops. This was a godsend as Don and Doreen were so kind and helpful and after Vern had heart attack, he and Don would go bike riding, fishing and we heard lots of railroad stories. Will be always remembered and greatly missed. Deepest sympathy to Doreen and family.